I told the story about how Rogue Amoeba was so terrific responding to me about a bug I found in their recording engine for Audio Hijack. I stand by my praise of them. I also mentioned that it would have been ideal if the problem hadn’t happened in the first place. I have to say, recently I feel like I am personally in charge of Quality Assurance for all of the things. Let me explain. According to Amy, she was unable to find anyone else who had found that bug. I had to do my recording for Don and splat some text on screen that said, “Yeah, this is a bug that Apple has confirmed I found”. Not exactly ideal for a video screencast, right? My QA job is not confined to software. Remember a while back my AirPods failed? When I took them into Apple, they saw something blue in the grill end and suggested that I had gotten them wet. Of course I hadn’t. I went home and took a macro shot of the grill and sure enough there was blue crystalline growth on it. But it wasn’t water damage. It was the battery leaking in both headphones! I took them back to Apple and convinced them to replace both AirPods and the case. And guess what happened this week? The left AirPod started failing on me! Yup. Every once in a while I’d put the AirPods in, after spending 4-12 hours in the charging case, go off on my walk and have the left AirPod alert me shortly afterward that it was below 10% battery. The next time the AirPod would charge properly. I took them back for the third time and got the left one replaced. We’ll see how that goes over time. Let’s talk about Ring for a moment. This will not be a happy moment. Ring makes the fabulous Video Doorbell and the new Floodlight Cam. I did reviews of both and loved them. I recently figured out that in addition to their great iOS app they have a Mac app. That’s fantastic! I installed it and noticed right away that it didn’t have the Floodlight Cam in the list of devices I could manage. I wrote to them and they said they were working on it. Frowny face but not that big of a deal. The other day, I had the Ring app open on my Mac and noticed that while I can’t select my Floodlight Cam to see a live view, the Floodlight Cam was showing up in the motion detection list. There was a nice little play button there just asking to be clicked. But when I clicked it, the most unexpected thing happened. Instantly Safari launched, opened two tabs, and began throwing popups all over my screen! This was disturbing, to say the least. Even more disturbing was the URLs of the two tabs. They were Doubleclick, an ad business run by Google, and hotjar, a web analytics company. For a company to whom I’m sharing my video camera with, tracking isn’t the first thing I’d be hoping they’re doing, right? At this point I asked Steve to try the software. He went to ring.com and found the download links. The page showed a typical Mac App Store image with the words “Download on the Mac App Store”. But guess what? It doesn’t take you to the Mac App Store, it downloads a zip file! Seriously. No way was Steve installing that zip file. I think he’s smarter than me because I never noticed this when I downloaded it a while back. So now I’m wondering if I have spyware on my Mac. Even though I run an anti-virus (ClamXav), I ran Malware Bytes just to be sure. My Mac came back clean. Since Steve wouldn’t play with me in this cesspool of a problem, I contacted my friend Pat Dengler who has all of the Ring devices and who would probably have installed the Ring Mac app. She had. She tested it and was able to confirm that she gets the popups and the tabs open to DoubleClick and hotjar as well. 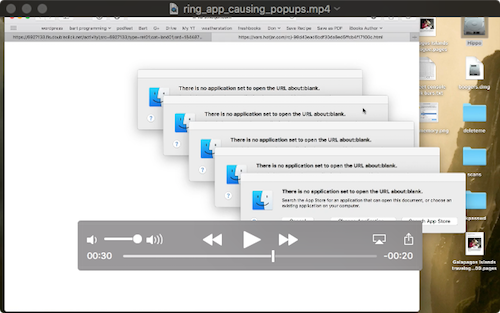 So I wrote to Ring including a link to the video I’d made (which is in the show notes by the way) and which clearly shows the popups and the two bad tabs. Their initial response was, get this, “uninstall and reinstall the app”. Are you kidding me??? I wrote back a response that suggested that was not a good response at all. I wasn’t mean but I was firm that this was a huge problem and I wanted it taken seriously. After going back and forth with them for six days, I finally included the CEO, Jamie Siminoff on distribution. I got a response immediately from him saying That a new app would be out that day or the next day. Great news. But two things went wrong with that. They didn’t change the misleading link on their download page that claimed it was a Mac App Store app, AND they didn’t come out with a new version of that app that day or the next day. Over the course of the next few days I got the most bizarre messaging I’ve ever seen from a company. In one email I asked yet again about the popups and the link to Doubleclick and asked if they’d figured out what was causing that aberrant behavior. The CEO responded with “We don’t have links to doubleclick. We are not aberrant.” Clearly he had not watched my video demonstrating that they do have links to DoubleClick. This was after one of the other Ring people who was responding to me said she’d showed my video to engineering and they confirmed the bug. But things got even more bizarre. On May 25th I got a message from the director of communications from Ring telling me that their Mac App Store app was approved. But when I asked them on the 27th why it wasn’t in the store yet, the CEO told me that they’d decided not to pursue putting their app in the Mac App Store. That was weird. But he did say that they’re going to change the link “ASAP” on the downloads page to reflect that it’s not a Mac App Store link. That’s a 30 second fix, we’ll see how long that takes. At the very least the messaging from Ring has been awful, but I guess all companies aren’t Rogue Amoeba. If there’s good news in this story, it’s that the new Ring app doesn’t launch your web browser and open links to questionable sites and cover your screen with popups. It’s really cool to be able view my Floodlight Cam from my Mac now. Let’s switch back to complaining about Apple hardware again, shall we? You may remember me telling the story about how the iPad Pro keyboards had a failure that would cause them to not actually type on the iPads. Mine had that affliction, so I made an AppleCare appointment and toodled off to the store to have them replace it. When I got it home though, every once in a while, my iPad would go berserk. And by that I mean the different elements on screen would start blinking independently of each other. I put a video in the show notes so you can see it for yourself. When this kind of thing happens, a reasonable person would march right back to Apple and demand it be replaced again. But instead I just wished it to stop. After a couple of weeks of this happening every 3 or 4 days, I finally made ANOTHER appointment at the Apple Store. I was very surprised when my little friend Marco at Apple said, “Tell you what. 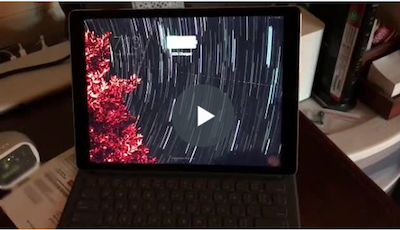 We don’t know now if it’s your iPad or your keyboard, so let’s replace both.” I was floored! I didn’t think that was necessary but who am I to argue? But I should have argued. We set up the second iPad from a backup of the original iPad. Everything looked great…till I got home that is. About an hour after I got it, the screen suddenly got horizontal lines through it, flickered a bit, and the iPad rebooted. Un. Believable. I didn’t think wishing this one would go away was a good strategy. I immediately made yet another AppleCare appointment. Over the course of the next day or so, the iPad screen would do something bizarre and reboot. Often when I wasn’t playing with it, I’d come back and it would tell me it had restarted. One time it even made a screeching sound before rebooting. So I set up yet another AppleCare appointment and trotted off to Apple a few days later. I was delighted that they assigned Marco to my case again. He gave me a third iPad Pro which we backed up from the second iPad that was a backup of the first iPad. It’s probably going to be fine, but I have to say I’m watching it with a doubtful eye waiting for it to misbehave. It has come to my attention that almost all of my friends are not seeing my shared activity from the Apple Watch, but I get all of their notifications. They can’t re-add me because we’re already connected. It appears to have started while I was in Peru. It would make sense if no one could see me but some can. You know what that means? I have to call Apple. Again. Sigh. I use a fantastic app called ScreenFlow from Telestream to record video screencasts for Don McAllister’s ScreenCasts Online. I love this software. 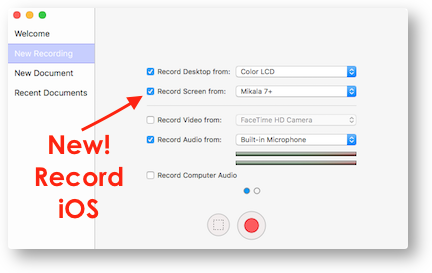 Don recently told me that they had added a new feature that allows you to record iOS devices right into the screencast. This is an improvement from our previous method which was to record in QuickTime, save the file and then import into ScreenFlow. I was really excited about this feature. In ScreenFlow when you start a screen recording you hit command-N to open the window to define your audio and video sources. Once you choose the audio and video sources, you hit the record button. You record for a while, stop, and do some edits in the editor. Now you presumably want to record some more. You could hit command-N again, but if you use the software a lot you get used to hitting command-shift-2 to start a new recording. It always keeps the last settings you gave it. Except that’s not what happens with the new iOS recording option. After you record once, the next time you record, the iOS video recording is de-selected. That means if you forget to go back and check it each and every time, you will have recorded nothing but your voice. The good news is that Telestream was closer to Rogue Amoeba than to Ring in their response to my bug submittal. They wrote back right away, asked for some clarification and then responded that they’re able to replicate the bug and told me they’d submit it for a fix in the next revision. Since there’s a workaround, that’s cool with me. 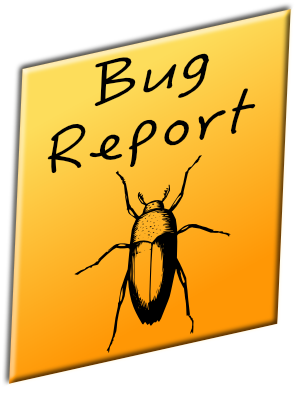 Since I submitted that bug I’ve found two more bugs in ScreenFlow, but you know, I’m getting kind of tired of writing up all these bug reports. I don’t want to be in charge of QA for all of the things. But if that IS my job, I want a raise because it’s exhausting work. Thanks for all this. We users of technology are (eventually – depending on the company) the winners. Hmmm. The video is public in Dropbox. Works on my iPad Pro but it could be because I’m the owner. Not sure how to test! Yeah I’m in guided access cuz my parents put me there, I listen to this every night, I’m currently not in it. And I’m using safari and it works fine. Wait, I’m the raspi & aurduino guy, not “do you have the beta”! That’s weird.